Ah, nature, we all want to capture the majesty of it in pictures, on video, on canvas and with pencil and paper, and you want to learn how to capture nature like the multitudes of people you see online. The problem is you're trying and gotten frustrated time and time again. You've looked up tutorials, tried to follow books that claimed a step-by-step process only for it to leave you with more questions than what you started. You're in luck. I understand your problems, and I was in your place. That is why I have put together this beginning tutorial book to get you started. I promise to take you step-by-step and explain the process along the way to answer the questions you have from other sources. 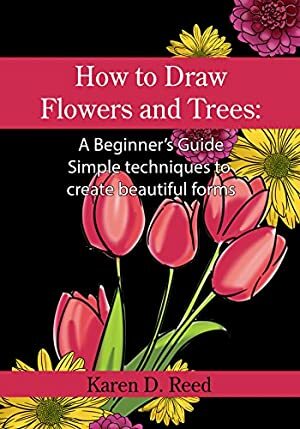 So, if you're ready to start learning how to draw flowers and trees, this is the book for you. What are you waiting for? Tags: draw books, draw flowers, drawing books, drawing flowers, drawing for beginners, drawing trees, how to draw, how to draw flowers, botanical line drawing, sketching, draw plants, how to draw flowers beginners, drawing ideas, drawing with imagination, easy drawing ideas, easy drawings, cool drawing book, cute drawing book, things to draw book, pencil drawing techniques. Track It. This book reaches FREE about 18 times a year. Log In to track Karen D. Reed on eReaderIQ. to be notified each time the price drops on any book by Karen D. Reed. to stop tracking Karen D. Reed. We started tracking this book on May 24, 2017. The price of this book has changed 70 times in the past 697 days. The lowest price to date was FREE last reached on March 24, 2019. This book has been FREE 35 times since we started tracking it. The highest price to date was $3.99 last reached on March 25, 2019.